Britain's Rebecca Adlington began the defence of her 800m Olympic crown by qualifying quickest for Friday's final. The Mansfield-based swimmer, who won 400m bronze on Sunday, finished in eight minutes and 21.78 seconds with Denmark's Lotte Friis second fastest. 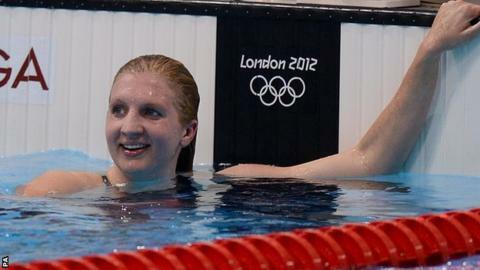 "I wasn't taking any chances," Adlington told BBC Sport. "What is quite charming about Becky is that she doesn't know how good she is. She talks about others. She loves the whole team environment and taken the role of leader. She gets a buzz off what everyone else can do. I think Becky might have to be at her best and that might mean breaking the world record." "It's so bizarre not knowing what time you're doing when racing 800m. I was ahead in the 400m [heats], but scraped through [to the final in eighth]." As with last year's World Championship final, where Adlington edged gold, the 800m Olympic title is likely to be between her and Friis. "Lotte is so lovely," remarked Adlington. "We've been racing each other since the European juniors in 2004. One year I win, the next year she wins. "I'm going to give it my all in the final, it's all about who can get that finish." American Katie Ledecky, 15, was third fastest in the 800m, but team-mate Kate Ziegler and China's Xin Xin, who had recorded the third and fifth quickest times of 2012 ahead of the Games, surprisingly missed out, as did Britain's Ellie Faulkner. European Champion Elizabeth Simmonds swam a sluggish two minutes 10.37 seconds in the 200m backstroke, but scraped into the semi-finals alongside Stephanie Proud. Britain's Adam Brown failed to reach the semi-finals of the 50m freestyle after recording a time of 22.39 seconds in his heat. George Richard Bovell of Trinidad & Tobago posted the fastest time of 21.77 seconds, marginally quicker than Brazil's defending champion Cesar Cielo Filho (21.80). Michael Phelps, who became the most successful Olympian of all-time by taking his medal tally to 19 on Tuesday, survived a scare before progressing to the 100m butterfly final. The 27-year-old was eighth at the halfway point, but powered down the final length to win the final heat in 51.72 seconds. Phelps qualified second quickest for Thursday evening's semi-finals behind 200m butterfly Olympic champion Chad Le Clos of South Africa. British hopes Michael Rock and Antony James failed to get out of their heats.